Russell Osborne Greenaway enlisted in 1915 and served as a Corporal with the 2nd Battalion in England and France where he was wounded several times. He married Gretta S. Bartlett of Thamesford and pursued a career in the grocery business, having one store in Thamesford, two in Ingersoll and one in Tillsonburg. As the second war loomed he disposed of his businesses and served his country again. He enlisted in London in 1940 as a member of the Royal Canadian Army Medical Corps, 25 years after enlisting in WW1. 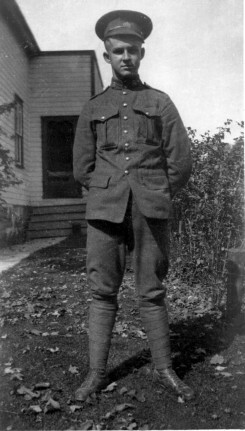 His rank was Sergeant and he was stationed at London and Ipperwash in Ontario, Valcartier, Quebec, and Sussex, New Brunswick. In September 1945, he returned to Thamesford,Ontario where he spent his remaining years.